UW graduate, BS in Biology; Washington University School of Medicine, St. Louis. His residency was at Providence Family Practice Residency Program in Seattle. 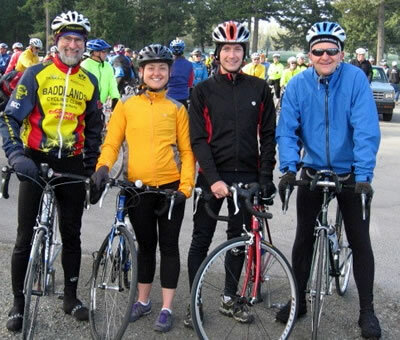 Dr. Rice enjoys road racing, bike touring, and mountain biking, as well as cross-country skiing. He has practiced in Libby since 1977. Emergency Medicine: Brian Barstad, M.D. • Jay Maloney, M.D. • Joseph Nicoletto, M.D. • Mark Serra, D.O. • Raymond Zurcher, M.D. Family Medicine: Jana Peters, M.D. Center for Asbestos Related Diseases: Brad Black, M.D. • Alan Whitehouse, M.D. Clinic: The Libby Clinic is a MT WWAMI WRITE site, a Rural/Underserved Opportunities Program site, a TRUST site, and has been involved in the training of PA students and family practice residents. 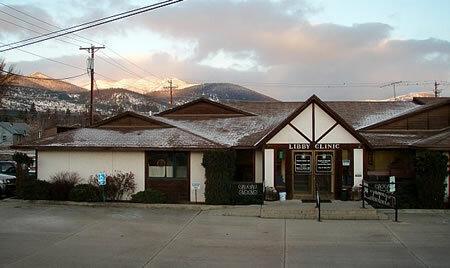 The Libby Clinic is fully staffed with a nursing department, medical records, and laboratory. There are three family physicians, one certified also in internal medicine, two family practice nurse practitioners, and a physician assistant at this clinic. Nursing Home: Libby Care Center is a 100-bed facility located at 308 East Third Street. All providers see their patients at the care center. 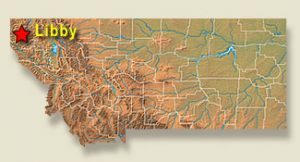 Nestled in isolated wilderness in northwest Montana, Libby offers a unique rural health care experience. With an immediate population of 2,000 but serving an outlying area of close to 20,000, Libby’s health care system serves a critical need in this remote area. Students can expect a traditional family medicine experience that encompasses the full spectrum of health needs, physcial and mental, inpatient and outpatient. OB call is shared with three family physicians and the OB/Gyn. WRITE students can work with the ER docs, the OB/Gyn, and the surgeons. Consulting specialists include a visiting cardiologist, urologist, ENT, and dermatologist. Two 4th year selectives are now offered in Libby, in OB/Gyn and Surgery, as well as a 3rd year Family Medicine clerkship. Fully furnished (all the way down to the sheets and towels) 2-bedroom house with washer and dryer. Secluded back yard with a deck. Attached garage. The house is about a mile from the Libby Clinic and hospital. If needed, a bike and/or car may be available. Wireless connection. On occasion a TRUST student or RUOP student or resident physician may share accommodations. From Spokane: HWY 95 North through Sandpoint and Bonners Ferry, then HWY 2 East. From Missoula: HWY 93 North, West on HWY 200, then State HWY 56, and then HWY 2 West. To see a map of where we are located and/or get directions from other locations, go to maps.google.com (for directions, click “Get Directions” in the upper left-hand corner where you can input the starting address). 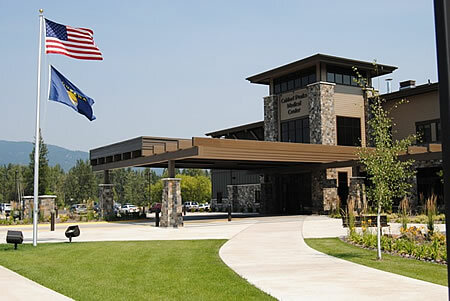 Air Transportation: Flights are available to Kalispell–90-mile drive; flights into Spokane available via most major airlines–175-mile drive, and Amtrak rail service is available into Libby. L-R: Dr. Greg Rice w/ 2009 Libby student, Emily Beck, 2009 Sandpoint student Louis Poppler, and Sandpoint preceptor Dr. Dan Meulenberg. Area activities include camping, hiking, hunting, road and mountain biking, x-country and downhill skiing (Turner Mountain), boating, snowmobiling, rafting, bird watching, and golf. In March is a weekend Irish Fair and each Mother’s Day weekend is the annual STOKR (Scenic Tour of the Kootenai River), a 2-day ride that raises funds for Habitat for Humanity. Indoor fitness can be attained at the Montana Athletic Club with special rates for medical students through the hospital. The Kootenai National Forest surrounds Libby and the Kootenai River, and a “Blue Ribbon” trout fishing area runs through the town. Area wildlife includes elk, moose, deer, mountain sheep and goats, cougar, and bear. Bald and golden eagles, ospreys, herons, and other birds can be seen nesting and fishing along the river and surrounding lakes. 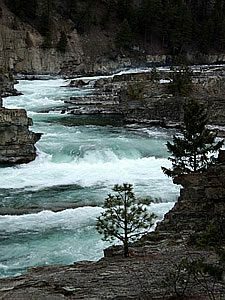 While the Kootenai National forest is full of enough beauty and outdoor adventures for anyone’s taste, Glacier National Park is about a 2-hour drive away. Average temperature in January is 31.8° F and the temperature averages 90° F in July. Keep in mind these are averages–temperatures can reach well below zero in January and February.